Devin Smith is back in the league. The former Jets second round pick signed a reserve/futures deal with the Cowboys today, according to his agent Jason Bernstein (Twitter link). The 37th overall pick of the 2015 draft, Smith spent the entire 2018 season out of football after the Jets waived him back in July. Smith was always high on talent coming out of Ohio State, but was plagued by injuries once he reached the pros. He played in ten games his rookie season but managed just four in 2016 before missing the entire 2017 season with his second ACL tear. In his Jets career, he caught just ten passes for 135 yards and one touchdown. The Cowboys have been doing whatever they can to upgrade their receiving corp ever since releasing Dez Bryant, first by drafting Michael Gallup, then by signing Allen Hurns and trading for Amari Cooper, and now by taking a flyer on Smith. Smith was always known as a speed demon, and drew comparisons to DeSean Jackson coming out of college. Still only 26, it’s still possible he could develop into a legit deep threat for a team one day if he can stay healthy and prove he still has the burst he used to have. With the reserve/futures deal, he’ll be added to Dallas’ offseason 90-man roster and be with the team for OTA’s and training camp with the chance to compete for a roster spot. 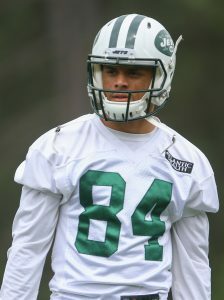 After being unceremoniously cut by the Jets back in July, wideout Devin Smith seems to be targeting a return to the NFL. ESPN’s Rob Demovsky reports that the former second-rounder auditioned for the Packers yesterday. The 2015 second-round pick out of Ohio State spent the first three seasons of his career with the Jets, but the six-foot-one receiver struggled with injuries during his tenure in New York. Smith tore his ACL during his rookie season, and he suffered the same injury in 2017. He landed on the Jets’ injured reserve after being waived/injured in May, and he was officially cut by the team in July. The 26-year-old ultimately appeared in 14 total games with the Jets, hauling in 10 receptions for 135 yards and one touchdown. Smith went unclaimed on waivers, and he was only able to garner a pair of workouts throughout the regular season. The receiver auditioned for the Texans back in late November, and he worked out for the Eagles earlier this week. Of course, with the Packers set to play in their season finale tomorrow, the team is clearly eyeing Smith for a potential role in 2019. If Green Bay were to sign the wideout, they’d presumably ink him to a futures contract. The Packers could use some reinforcement at receiver, especially with Randall Cobb set to hit unrestricted free agent and Geronimo Allison facing restricted free agency. Former Jets wide receiver Devin Smith went unclaimed after being placed on waivers earlier this week, according to Ian Rapoport of NFL.com (Twitter link). It’s perhaps unsurprising that no other NFL club decided to take a chance on Smith, as he’s suffered two torn ACLs since entering the league as a second-round pick in 2015. He first injured his ligament during his rookie campaign, and then tore his ACL again during New York’s first team workout in 2017. Any team that had acquired Smith via a waiver claim would’ve been responsible for his $1.236MM base salary for 2018. None of that figure is guaranteed, and the Jets still have Smith’s signing bonus proration on their books, but it probably wasn’t viewed as worthwhile for many teams to take on his salary, even if on a tryout-type basis. Because he was not claimed, Smith is now a free agent and allowed to sign with any club. It’s unclear if any team will now be willing to give Smith an opportunity, but as of May, he still wasn’t practicing, a poor indication of his recovery (Twitter link via Rich Cimini of ESPN.com). Any new deal that Smith lands will surely be of the non-guaranteed variety. Viewed as a deep threat coming out of Ohio State, Smith has only managed to appear in 14 games (three starts), and hasn’t played since 2016. In those 14 games, Smith posted 10 receptions for 135 yards and one touchdown. The Jets are releasing former 2015 second-round pick Devin Smith, a source tells Adam Schefter of ESPN.com (on Twitter). The wide receiver has suffered two torn ACLs in his career and has struggled to recover from them. The Jets were already set with their top four wide receivers thanks to the presence of Robby Anderson, Jermaine Kearse, Terrelle Pryor, and Quincy Enunwa. After that, last year’s draft picks Chad Hansen and ArDarius Stewart are fighting for their jobs along with kick return candidates Andre Roberts, Charone Peake, and Lucky Whitehead. Simply put, there was no room left for Smith, especially since he was a holdover from the old regime. Smith tore his ACL in the first team workout of 2017, ending his season before it could begin. He tore the same ligament during his rookie season in 2015, meaning that the former second round pick has been on the field for just 14 games in total. It’s fair to wonder whether Smith will be able to get back on track after suffering the same serious injury twice. In his limited action, Smith caught ten passes for 135 yards and one score. Teddy Bridgewater has only been a Jet for a couple of months now, but trade rumors have been swarming pretty much non-stop since Bridgewater first signed with the team. Many have speculated that the New York could look to move Bridgewater if he shows he’s healthy during the preseason but the Jets decide to roll with Josh McCown and Sam Darnold as their quarterbacks. Slater thinks both 2015 second-rounder Devin Smith and 2016 seventh-rounder Charone Peake are on the roster bubble as the team’s wide receiver depth chart sorts itself out. Smith has been plagued by injuries since entering the league as the 37th overall pick. Awful news for Jets wide receiver Devin Smith. Smith tore his ACL in the first team workout of the year, GM Mike Maccagnan told reporters moments ago. He already had surgery for the tear and will miss the entire 2017 season. Smith, 25, suffered an ACL tear in the same knee in his rookie season. All in all, the 2015 second round pick has seen just 3 games of action in total since entering the league. Smith was one of Maccagnan’s first draft picks as Jets GM and we’ll have to wait another year to find out whether he can bring anything to the table in New York. The Jets now have seven wide receivers on the roster as they look ahead to the 2017 season. Eric Decker, Quincy Enunwa, and Robby Anderson lead the way with free agent pickup Quinton Patton, third round rookie ArDarius Stewart, Charone Peake, and Jalin Marshall in support. One has to imagine that Smith’s injury and Marshall’s four-game ban played into the team’s decision to draft Stewart. We heard several days ago that Bills GM Doug Whaley was unwilling to commit to Tyrod Taylor as the team’s starting quarterback of the future until after the season, and Ian Rapoport of NFL.com reports that no talks regarding who will be the team’s 2017 quarterback have taken place. The Bills’ decision-makers appreciate that Taylor has just 26 career starts to his name, and they will evaluate his entire body of work–including the final four or more games of 2016–with that in mind. If they decide Taylor is their man, the Bills could pick up his 2017 option, thereby kickstarting a new five-year, $80MM+ deal, or they could redo his contract to make it more palatable, which Rapoport believes is the more likely option. If Buffalo moves on, Rapoport expects the team to be active in the veteran quarterback market with a possible eye on Tony Romo. Jay Cutler and Colin Kaepernick also could be on the Bills’ radar. We learned last night that the Cowboys would be without return specialist Lucky Whitehead for tonight’s game against the Giants, and Ian Rapoport of NFL.com reports that Whitehead was indeed left home in Dallas for missing a team meeting, which has been a recurring issue for him. Even if the Cowboys reach a point in the regular season when they have nothing to play for, they do not plan to rest their starters, according to Rapoport. Dak Prescott would be a logical exception to that rule, though Tony Romo may not be the replacement if Prescott comes off the field. As Rapoport writes, Dallas would want to keep Romo safe in case Prescott should suffer an injury in the playoffs (Twitter links). We learned earlier today that Jets head coach Todd Bowles is expected to keep his job, but that Chan Gailey might not be so lucky, Nick Mangold may be considering retirement, and that Woody Johnson might not be the one in charge of the team’s day-to-day operations in 2017.